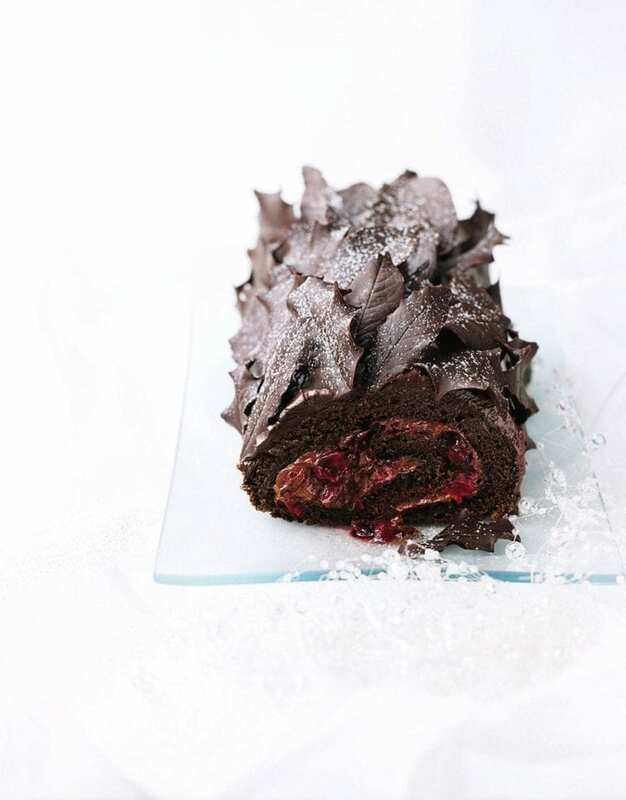 Crowd-pleasing, indulgent and easy to make,this classic chocolate roulade is a great Christmas dessert. Preheat oven to 180°C/fan160°C/gas 4. Line a Swiss roll tin with baking paper. Beat the eggs and sugar together with an electric whisk for 5 minutes until thick. Sift over the flour and cocoa and fold in with the vanilla and chocolate extract, if using. Spread in the tin. Bake for 12-14 minutes. Turn out onto baking paper sprinkled with sugar. Cool a little, then roll up from the long side with the paper. Cool. Put the berries, sugar and 2 tablespoons water in a pan and cook for 7-10 minutes. Cool. Put the chocolate and butter in a mixing bowl. Heat 450ml cream in a pan until almost boiling, then pour over the chocolate. Leave for 5 minutes, add the bourbon and stir until smooth. Cool for 10 minutes, then whip until light. Transfer a third of the ganache to a bowl. Whisk in the remaining cream. Unroll the sponge, spread with the creamy ganache, then spoon over the cranberries and re-roll. Ice the roulade with the remaining ganache. Decorate with chocolate leaves and dust with icing sugar. When you line the Swiss roll tin with a sheet of non-stick baking paper, trim the paper to stand proud of the tin by 3cm. This will give the roulade space to rise. For best results use an electric hand whisk or mixer to whisk the eggs and sugar together at top speed until thick, pale and airy – the beaters should leave a ribbon-like trail behind when lifted. Use eggs that are a few days old and bring them up to room temperature before whisking – they will whip up more easily and make the roulade lighter. When folding the flour and cocoa into the whisked egg mixture, try to retain as much air as possible. Use a large metal spoon or a spatula and gently cut through the mixture, rotating the bowl as you do so. This is a brilliant dessert for dinner parties because you can assemble the roulade up to 5 hours ahead.